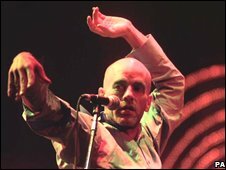 A concert by American rock giants REM at Cardiff's Millennium Stadium has been switched to a smaller 7,500-capacity indoor venue across the city. Band management blamed the state of the economy for low ticket sales, meaning the 25 August show will instead be at the nearby Cardiff International Arena. Tickets, which cost £45 face value, are still valid but fans can get a refund. About 18,000 tickets had already been sold for the stadium, against a capacity for the show of about 35,000. REM are due to start their 30-date European tour on 14 August in Salzburg, and are also playing outdoor shows in Manchester, Southampton and London. Bob Gold, the band's European manager, said sales had not met expectations and it was decided it was better for the band and the audience to move into "a smaller, more intimate venue". Fans who have already bought tickets have been contacted about the change. They can use their stadium tickets, or get a refund, and have been offered discounts on other REM shows at Twickenham and Southampton. Mr Gold blamed the general economic situation for the lack of sales, although he said tickets for REM's other UK shows were "satisfactory". Bruce Springsteen attracted a 48,500 capacity crowd to the Millennium Stadium when he performed earlier this summer, while Neil Diamond attracted 26,000. Madonna will kick off off her latest tour at the stadium when she performs on 23 August. REM became the first band to play before a new curtain at the Millennium Stadium in 2005 which turns it into a smaller arena. They also performed at the old Arms Park - where the current Millennium Stadium now stands - in a sell-out concert in 1995.